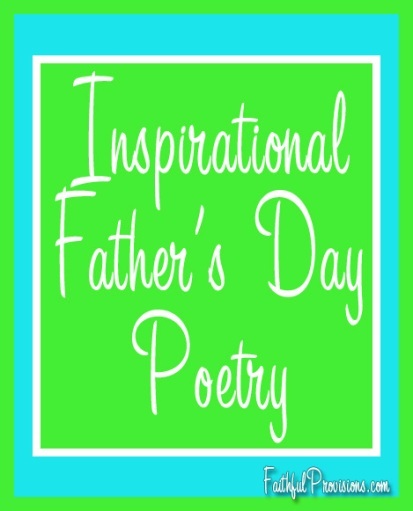 If you are blessed to have grown up in a Christian home with a Christian dad, stepdad, or granddad, take a look at the inspirational Father’s Day poetry below. “God Give Us Christian Homes” is actually a four-stanza hymn by B. B. McKinney. I think the two verses I have included here would make a beautiful card. You could have children draw a picture of a house on the front of the card, and then inside, you could have a picture of Dad with his family. This would be great to put on a scrapbook page or in a photo book. It’s so inspirational. Christian poetry for Father’s Day is not always easy to find, but going back to old hymns is one way of doing it. If you’re looking for more contemporary inspirational poems for your dad, you might like to use the words to “Love will be Our Home” by the wonderful Steven Curtis Chapman. Looking for some poems for your cards for Dad that are light-hearted? Try these funny poems for Father’s Day, or these happy poems for dads. You might also like this beloved Father’s Day poem by the great Christian poet Helen Steiner Rice.